To handle those messages, new entries will be added to the context menu. 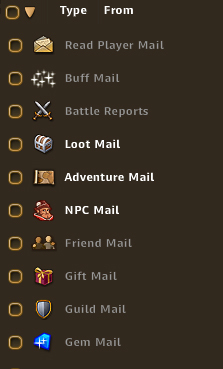 This should lead to a much more efficient and simple way of sorting through your mail window; especially if you're an avid user of the Trading Office or a keen adventurer! Important: Keep in mind that balancing, functionalities and optics may change until content from the test server hits the live servers. Head over to the public test server to see the changes for yourself! Feel free to share your feedback with us in our dedicated feedback thread. Last edited by BB_Saqui; 28.08.18 at 14:17.